WorldGuy's Walk for Diabetes Awareness -: A shorter distance. The first day out of Louisville I left late in the day from Clarksville. It was overcast and deceptively cool. We had walked a few blocks from the van when the clouds broke clear and the true heat of the summer day shone through. We were soon walking from one shaded spot to another. The women in the first car to stop gave me their phone number to call at the end of the day for a ride back to get the van. It was good to have that daily detail handled . We walked under the expressway overpass into Jeffersonville and followed the main road out of town. It took all afternoon to pass the miles of business and restaurants. When I got to the last parking lot of a mall where I thought I could park I called the women. They didn't answer. I left a message and began walking on. My GPS showed a gas station two and a half miles away, in Utica. The road opened to grass on the sides. Calling my contact, again with no answer, I settled into rolling over the tall dry grass. I had rolled over the tall weeds a few hundred yards when some folks across the road invited me over for a drink of water. Within a few minutes they had offered a shaded place to park for the night and shuttled me back to Jeffersonville. When I returned I was fed and had a shower. Good people and great conversation. I was glad the women had not answered. Worrying about a ride never helps and even if they didn't give a ride, having the offer set my mind at ease. In the morning we started out fresh. The grass was wet and pliable from morning dew. I'd rather push a wet and heavy ball through tall wet than stiff crackling straw. After passing through Utica we spent most of the day on the parallel old road that was now the lane in front of the old gunpowder plant. The complex is now miles of industrial park. The four lane has been built in the decades since I last travelled up this way. The only traffic on the access lane were cyclists out for a Sunday ride. I had many pleasant visits during the day. One of the cyclist later met me while driving and at the end of the day gave me a ride to where I began. I spent the night in a truck parking area on the corner of Charlestown next to the gas station there. At the crest of the last difficult hill a woman was going out for her mail. She told me she walked yearly for the diabetes cause with JDRF. A close friend's child was diabetic. She offered me a sandwich and tea. We shared stories, good and bad, of friends and relatives with the disease. I learned a few things about about the area, while I sat on a log in the shade. The retired teacher had lived there four decades. I so enjoy such coincidental meetings. The road eventually opened to farmland. The heat of the day pushed us from shade to shade. I had been told of a store that was midway to New Washington. The store was much farther than I was told. Just as our energy was waning a man who I had met who said he would pick me up at the store after he and his girlfriend went house-hunting pulled into a drive ahead. 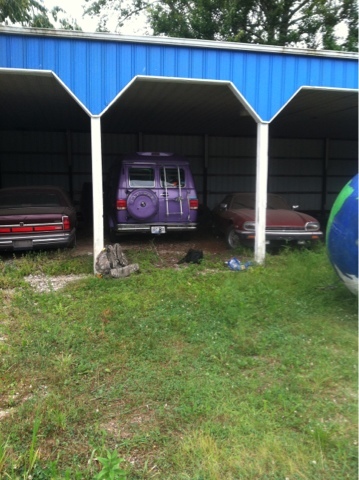 The place he pulled in was a storage lot with a four bay outbuilding and a closed auto repair building. While we we talking the owner drove in. He let me stop there. I rolled the world in the open carport and in a few minutes was back with the van. I am always amazed a grateful how these thongs work out. The.rest of the hot day was much more tolerable under the shade of the carport between an old Lincoln and a Jaguar covered in dust. We are less than five miles away from town. We both could use a shorter walk today. It is drizzling occasionally this morning. The clouded skies are good, but the rain is hard on my little companion who has metal plates on his legs. I know they must hurt. My leg muscles are sore also from my recent injuries. All in all, we are doing pretty good for two old dogs. Just passed you walking through New Washington. Very cool. Good fortune on your journey! I spotted you in Hanover Indiana this morning! My father and my sister are diabetics on behalf of our family as well thank you, for all you are doing!